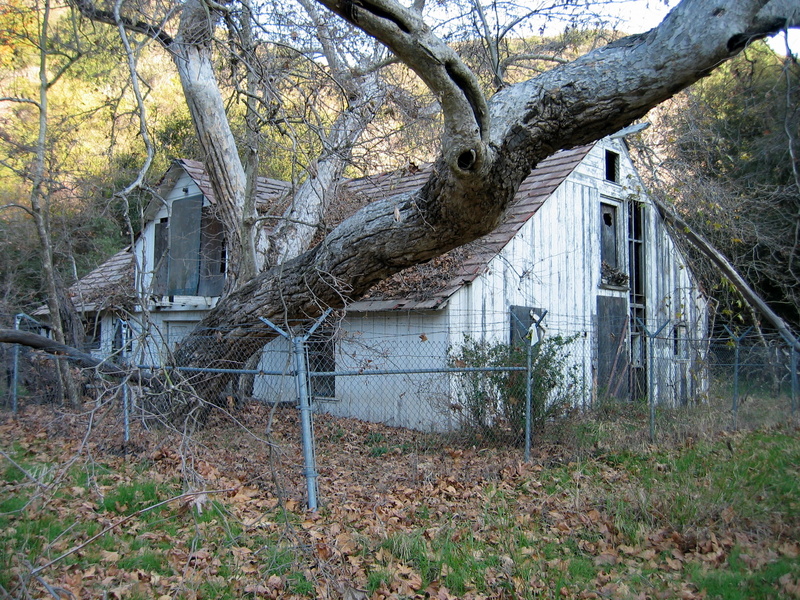 Rustic Canyon, near Pacific Palisades, California: There is a decent horror movie to be written about Rustic Canyon. In fact, I’ve already written it! This barely-accessible slice of the Santa Monica Mountains in western Los Angeles was the site of a Nazi sympathizer’s camp during the buildup to World War II. Plans were in place for 24/7 guards, automatic weapons at the upper gates, and terraced irrigation…until December 8, 1941. It was one day after the U.S. entered the war that one Nazi residing on the grounds was arrested; others had fled. Roughly 25 years later, the grounds became a hippie commune; today they are an overgrown haven for rattlesnakes, ticks, and poison oak…and for hearty explorers such as myself. Rustic Canyon is simultaneously beautiful and creepy. A gentle creek flows past a dilapidated, graffiti-tagged building. A lone redwood tree towers over an abandoned barn. Long concrete staircases descend to nowhere. Hikers often claim to hear voices coming from that barn, while others speak of having felt as if they were followed. Part of me yearns to explore Rustic Canyon at night…but I would never do so alone. Anyone wanna join me? 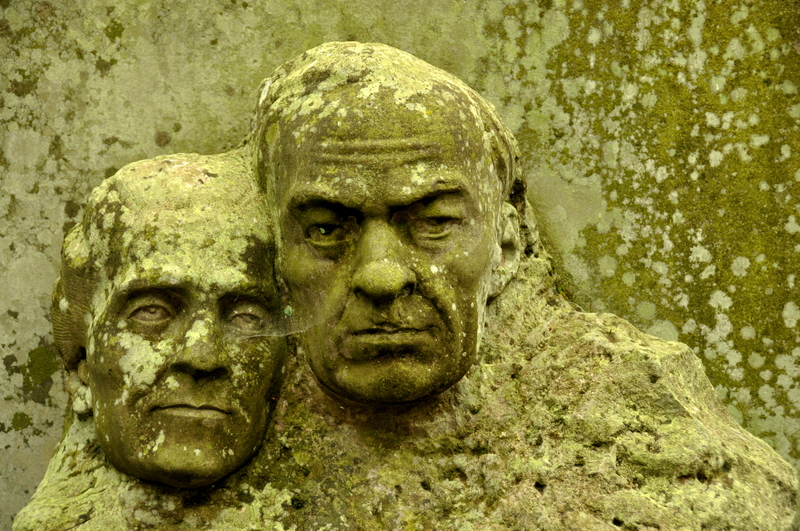 Lykachiv Cemetery, Lviv, Ukraine: Cemeteries are beautiful places. There, I said it. Although I seldom travel to a particular city seeking out its burial grounds as my singular purpose for visiting said city, I have come to appreciate cemeteries more and more. The Americas have some beautiful cemeteries – Arlington, Virginia comes to mind, as does the Gothic Recoleta in Buenos Aires, Argentina. But Eastern Europe sets the gold standard. Cities such as Zagreb host cemeteries so sprawling and peaceful that just seeing it makes one want to cry. But Lviv, aka Lwów, in western Ukraine (formerly Poland), is home to a labyrinthine complex that seems bigger than several football fields: Lykachiv Cemetery, on the extreme edge of the city’s Old Town. Upon entry to Lykachiv, you’ll see a main courtyard reminiscent of cemeteries everywhere: polished marble tombstones, many adorned with flowers, some bearing religious images – crosses, stars of David, etc. As you stroll along, though, the foliage slowly encroaches and the passage of time becomes more apparent. A spider web here. Overzealous tree roots there. A fallen tombstone – an angel, perhaps? A war memorial at the far end of the cemetery is one of the more moving sections of the cemetery…but it is surrounded on two sides by ugly, Communist-era apparent blocks and by ominous forest on two other sides. It is nice to linger here…but not for long. Inquisition Museum, Mexico City, Mexico: As I alluded to in my 2013 Día de Muertos post (and again in #8 below), Mexicans are obsessed with death. I learned while living there that their obsession isn’t morbid, but is familial – a way to keep the memories of deceased loved ones in your heart, while also wondering what it would like to join them in the next world. The #8 entry on the list is morbid, but it was packed with visitors – all of them Mexican save for one gringo – when I checked out the place in 2013. The Inquisition Mexico is housed, appropriately enough, inside the large Palace of Inquisition building in Mexico City’s Centro Histórico. It was here that Spain’s conquistadores condemned infidels for their non-beliefs, and the torture museum that sits on the grounds today outlines a ghastly array of torture methods, from the iron maiden to the guillotine. During my visit, I was mortified to learn about how ill-treated women in particular were, their bodies violated in manners that were thoroughly un-Christian. 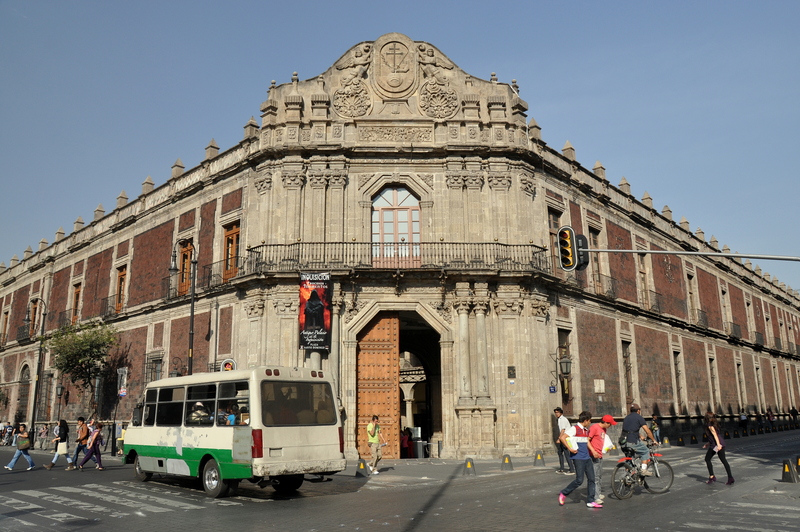 Torture and inquisition museums can be found all over the world, but Mexico City’s entry is especially noteworthy for being housed in the building where such torturous events actually took place. If that isn’t enough, the building also houses the Museum of Medicine, which features several additional galleries of disturbia. Miscarried fetuses at various stages of development? Here. Male and female genitalia ravaged by veneral diseases? Also here. Ciudad Perdida, near Santa Marta, Colombia: With apologies to Brazil, Colombia is the great South American success story. Vast swaths of the continent’s most populous Spanish-speaking country were off-limits to travelers as late as the mid-1990’s, courtesy of violent street crime and a nasty drug war. But the 21st century has seen a sort of rebirth for Colombia; streets are safe, Pablo Escobar is dead, and the FARC is no longer a credible threat. I went there myself in 2013, and that Colombia trip remains the highlight of all my travels to South America. The trip ended on a bizarre high note when I trekked four days into the coastal highlands to Ciudad Perdida – the “Lost City” of the mysterious Tairona people. Ciudad Perdida is a legendary city of gold, perched atop a series of impossibly steep hills in the middle of inaccessible tropical jungle. So what’s so scary about it? Well, for starters, the Tairona people have all but vanished…along with their gold. For another thing, the arduous trail that leads you to the site travels through what was, just a few years ago, FARC-controlled lands. 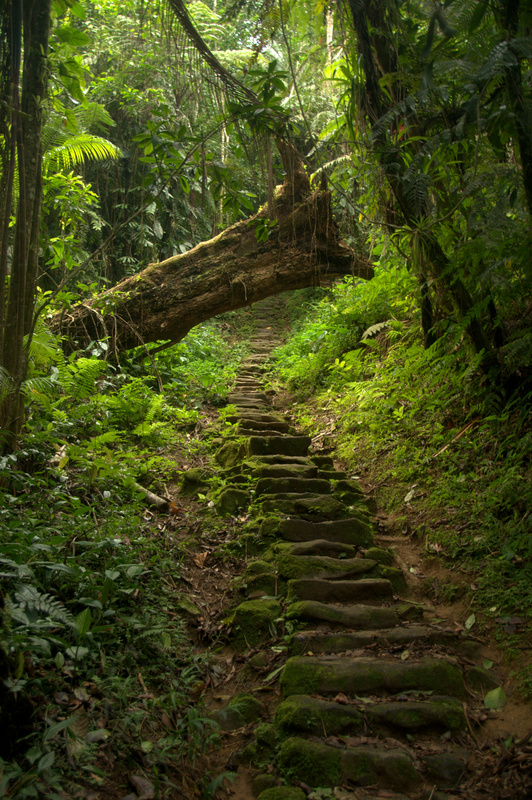 Although the FARC has been replaced by the Colombian army, the muddy trek passes armies of leaf cutter ants, ravenous hordes of mosquitoes, venomous snakes, machete-wielding farmers, and coca (as in cocaine) trees, and features perilous creek crossings, hundreds of rock steps (see photo below), fog-shrouded hills, and torrential rains that fall three out of every four days. Go take a hike! 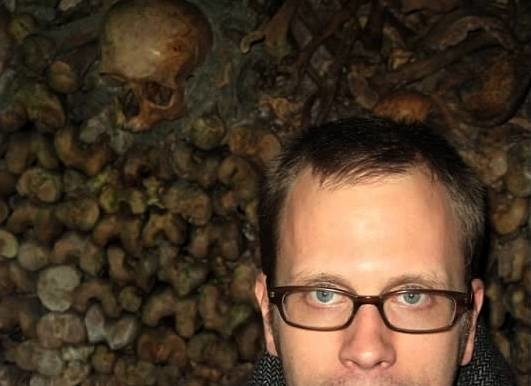 Catacombs of Paris, France: This bizarre sight, directly beneath central Paris, is unabashedly a tourist trap…but a tourist trap with dark passageways and hundreds (Thousands? Millions?) of real skulls. The underground ossuary, near Place Denfert-Rochereau in the Left Bank, is the final resting place for as many as six million fifth-century Parisians. I have read that the catacombs are actually tunnels left over from when the limestone-rich earth beneath Paris was sifted as a rock quarry, and later became Les Innocents, the main burial ground for the city’s poor. I can’t begin to imagine the smell of death and decay that must have filled the air. The grounds were finally upgraded into a respectable mausoleum in the early 1800’s. They became a proper tourist attraction soon after, and have remained so ever since, except during World War II, when French Resistance members used the tunnel system to move around while Nazis established their own underground bunker in adjacent tunnels at the same time! A visit to the catacombs today isn’t much different than it was 200 years ago; walls of skulls are interspersed with limestone sculptures. The combined feeling is both cheesy and creepy. Watch out for rats! 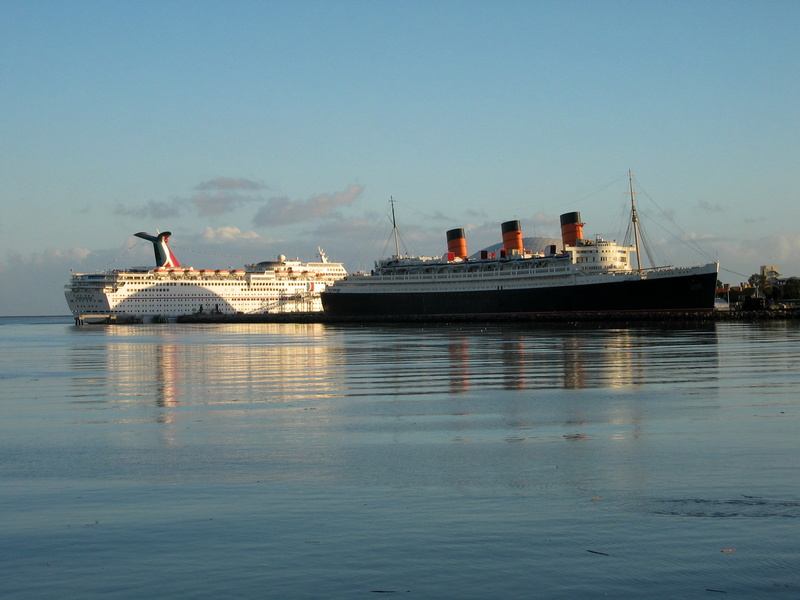 Haunted Queen Mary, Long Beach, California: The Queen Mary ocean liner, which first set sail 1936, today is permanently moored in Long Beach Harbor just south of Los Angeles. Half of the ship can be visited as a self-guided tour, while the other half exists as a hotel…that is rumored to be haunted. Approximately 50 people are said to have died on the ship during its heyday, not counting the U.S. servicemen ported around by the Queen Mary during World War II. Many visitors report sightings of ghosts drowning, and the corridors around Cabin B340 are said to have a larger than normal number of paranormal encounters. A year-round “Haunted Queen Mary” tour is somewhat cheesy, but does provide a glimpse into the bowels of the ship. A creepier and more interesting time to visit is during October, when the ship is decked out in full terror mode, with blood spattered on the walls, severed heads abound, and (fake) chainsaw-wielding goons chasing visitors through the ship’s bowels. The adjacent grounds feature no fewer than three 3-D mazes, and more costumed ghouls. A blast – and surely the best of the country’s haunted Halloween attractions. Mummy Museum, Guanajuato, Mexico: I have written about this place before, in my Five Days in Guanajuato post. To recap, it is a mausoleum housing the mummified remains of roughly 100 Mexicans, victims of a cholera epidemic and later disinterred because their descendants didn’t pay Guanajuato’s mandatory internment tax. The mummies are naked, so you can see what time (and preservatives) does to a centuries-old body. Pictures are strictly forbidden, except with special permission. According to Wikipedia, filmmaker Werner Herzog shot footage of the mummies for use in his movie Nosferatu the Vampyre, while sci-fi/horror novelist Ray Bradbury claims to have been thoroughly creeped out by his own visit, and that he felt obliged to leave Mexico as soon as possible. 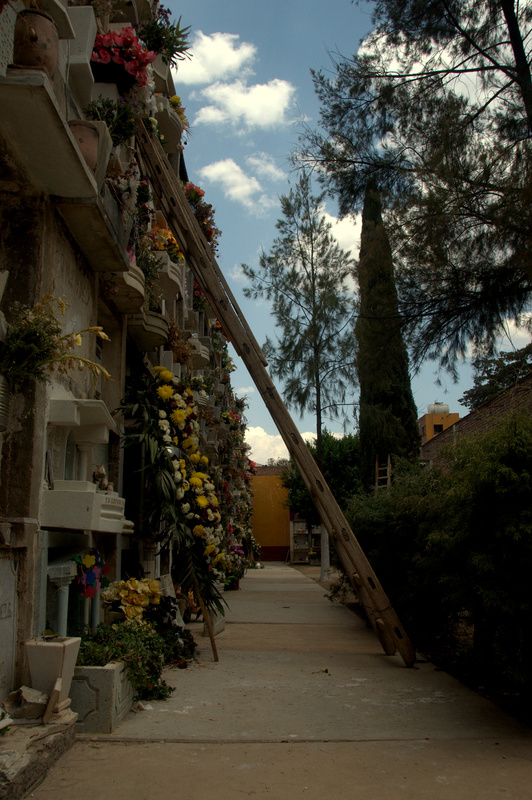 Personally, I recommend topping off your visit with a quick stroll through the adjacent Cementerio Municipal, which – like other such places throughout death-obsessed Mexico – is alternately peaceful and spooky. Just don’t linger around the area after nightfall – there may be actual ghouls in the area, and they would be of the knife-wielding mugger variety. 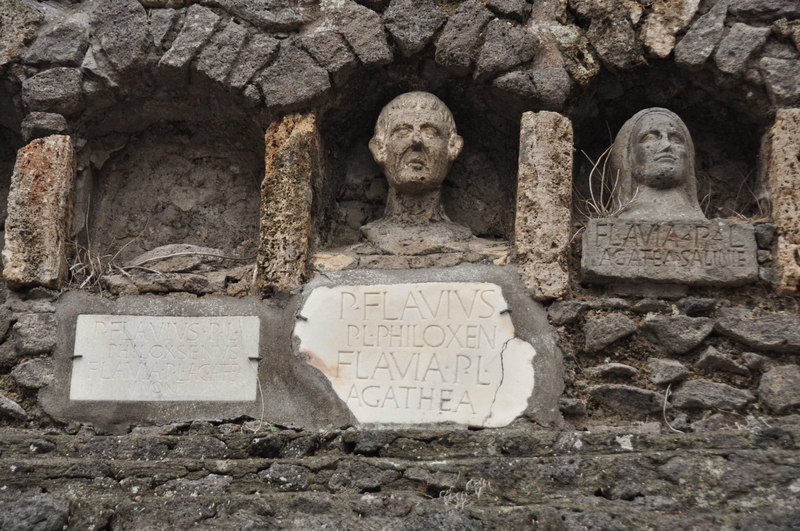 Pompeii, near Naples, Italy: What is creepier than visiting an abandoned city at the foot of an active volcano? Why, visiting a city that still houses ash corpses of its victims, that’s what! I had heard mixed reviews about Pompeii before I finally made it there myself in 2012. I found that the ruins vastly exceeded my expectations, and I frankly have no idea why some visitors claim to be disappointed in the site. Pompeii was a thriving Roman city just inland from the Adriatic Sea south of Naples – until a devastating eruption from nearby Mount Vesuvius in the year 79 A.D. buried the city in a blanket of ash, collapsing roofs and suffocating everyone. The creepiness factor comes from the fact that you can see still see plaster-casted mummies with expressions of terror on their faces. One of them is a pregnant woman! Additionally, the site sprawls over thousands of hectares, which means that you will have many abandoned streets to yourself, with only the weeds growing between the cobblestones as company…along with the occasional stray dog. My visit took place on a rainy day, so the city’s sea views were obscured by the fog, although Vesuvius still made its presence known whenever the clouds would part, adding to the ambiance. 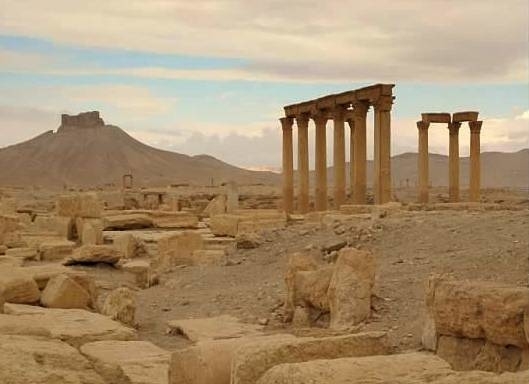 Palmyra ruins, Syria: I had mixed feelings about whether to include Palmyra on this list. The current political situation in Syria had me initially thinking that it was in bad taste to include that war-torn country’s top archaeological wonder on a list of spooky places. However, it is precisely because of the ever-worsening situation in Syria that I thought it worth including Palmyra. Were you travel back in time to the third century A.D., you would see Palmyra as a thriving Roman caravan city, mid-way between Palestine and Babylon. Today, it is a ghost town, and it has even seen the destruction of its monumental arch, among other structures, by ISIS. When I visited in 2007, Palmyra was already all but abandoned. A waiter at the nearest restaurant explained that tourism to the region essentially ceased after George W. Bush, in all of his infinite stupidity, proclaimed Syria part of the Axis of Evil. My friends and I toured the ruins under a full moon, and had the place to ourselves. This was more than a bit unsettling. The next morning, we visited the site in more thoroughness, but were still alone, eerily enough…surrounded by two millennia of crumbling desert history in what would soon become the saddest – and most dangerous – country in the world. GringoPotpourri note: for safety reasons, I do not advise you to visit Palmyra until the security situation improves. Monastery of St. Francis, Lima, Peru: The much-visited monastery and convento de San Francisco de Asís (Convent of St. Francis of Assisi) is one of the most interesting sites in the UNESCO-listed Centro Histórico of Lima. Not a lone building but a block-wide complex, the convent includes a library with over 25,000 texts. The granite-carved, baroque church is rich with religious art, including a “Last Supper” oil painting that shows Jesus and his 12 Apostles eating Peruvian dishes – guinea pig being one of them – rather than the traditional bread and fish portrayed in most interpretations. The spook factor – if the idea of holy men feasting on rodents isn’t scary enough – comes from the on-site catacombs. Discovered in 1943, the subterranean catacombs feature as many as 25,000 skulls and bones, some of them displayed in imaginative fashion. 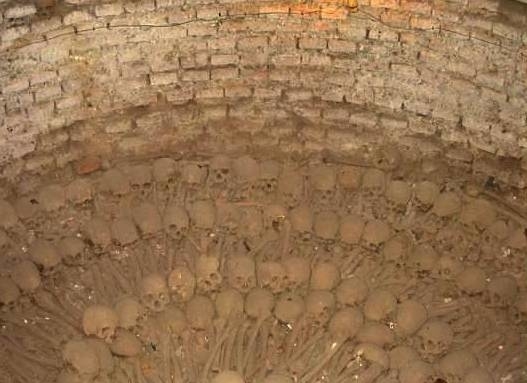 A cistern functions as an ossuary with skulls and femurs displayed in a circular pattern – a real creep-out. It turns out that the catacombs functioned as the Peruvian capital’s de facto burial ground until early in the 19th century, when a formal city cemetery finally opened. Have we not heard this story before?! As I insinuated in the introduction earlier, this post was written fully knowing that I haven’t seen all of the scary places I want to see. The infamous Sedlec Ossuary – Bone Church – in Kutna Hora, Czech Republic? I haven’t been there. The bizarre Isla de las Muñecas (Doll Island) in Mexico City’s Xochimilco lagoon? I never made it there, either. The Stanley Hotel, in Estes Park, Colorado and stand-in for the Overlook Hotel from Stephen King’s “The Shining?” Alas, it remains unchecked on my bucket list. What are your favorite spooky places, Loyal Reader? RE: catacombs… It is full of the bones of about 6 million people (or as they say “souls”). I want to go there… even with my claustrophobia… I just for sure wouldn’t part from the tour group! Most of the bones have either been exhumed or finally just disintegrated. There are hundreds or probably a few thousand still on display.